Santa is coming to Blackwood! On Tuesday December 18 starting around 6pm the Blackwood Fire Company will continue it’s yearly tradition of bringing Santa around to all the neighborhoods on the fire truck! As you all know Santa is very busy this time of year so we will not be able to stop and give out Candy Canes. Please keep your eyes and ears open Tuesday night December 18th!! Due to the pending weather forcasted for Saturday afternoon and night, we have decided to cancel this years parade. There is NO RAIN DATE for the parade, as we do not want to take away from any other fire company having one. We will keep the same theme for next years parade. National Traffic Incident Response Awareness Week is November 11-17th. The #Moveover campaign is spreading the word that when you see emergency lights, please slow down and move over! Our lives depend on it. For more information please click on the link and watch the video. On Saturday Night at approximately 9:30pm Stations 84,82 & GTFD Engine 88 along with GTEMS BLS 8-0 & Virtua Paramedics responded to Route 42 North for a reported Motor Vehicle Accident with Entrapment. Upon arrival crews found a vehicle overturned with multiple occupants heavily entrapped. Crews worked for approximately 3 1/2 hours at the scene. Unfortunately two occupants of the vehicle succumbed to their injuries. Our thoughts and prayers are with the families. Set your clocks back one hour this Sunday and change the batteries in your smoke detectors!! This weekend is daylight savings, we encourae everyone when they change their clocks to change out the batteries in their smoke detectors also! Click the links for more information. If you are unable to change them yourself and require assistance contact us and we will help you!! This afternoon TaskForce 852 was dispatched to the unit block of Del Sol Place in Gloucester Township for a reported Dwelling Fire. 8501 (Cheif Goins; Sta85) arrived to find fire showing from the A/B corner roof and shortly after stuck the All Hands. Engine 842 operated as the Second Due Engine Company. The crew laid a supply line from the hydrant to Engine 88, then proceeded to the second floor to hook ceilings, check for fire extension, and assist in ventilation. Ladder 84 was also on scene and assisted in the operation. 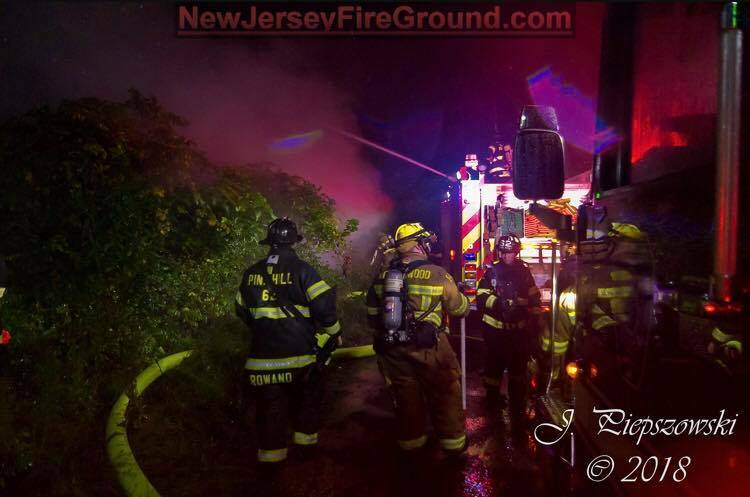 On Thursday Night at approximately 2200 hours TaskForce 621 (Pine Hill FD) was sounded for a working Dwelling Fire in Pine Hill/Clementon. Engine 62 arrived in the area to find a heavy smoke condition, and moments later discovered the house on fire. Engine 842 responded with a crew of 4 and established a water supply to Squad 86 (Gloucester Twp Fire Dist 6) and Engine 62 (PineHill FD). Engine 842’s crew also stretched a 1 3/4” hand line to the rear of the house for fire attack. The fire was placed under control just after midnight and the engine crew went available around 0105 hours. Great work by all companies involved. See for Important Information regarding the Understanding and Fighting Basement Fires class being hosted by the Blackwood Fire Company at CCRETC. Register here or click the link on our home page under Upcoming Events. On Tuesday night members were given the opportunity to attend a Torch Cutting and Burning Class at the Camden County Regional Emergency Training Center. The members got to train on the proper use of several different cutting torches we carry on Rescue 84 and are carried throughout the county. A big thank you to Instructor/Battalion Chief Frank Sandrock (Camden FD) for teaching this drill for our members. On Saturday at approximately 1500 hours, Engines 86,85,88 Squad 25 (Winslow FD) Squad 13 (Cherry Hill FD) Rescue 1 (Camden FD) Battalion 1 (CFD) Battalion 13 (CHFD) GTEMS BLS 803 EMS 80 and Virtua ALS were dispatched to the area of Lakeland Road for a Technical Rescue. While enroute companies were advised of a ferris wheel stuck and about 6 children trapped at the top. 8602 (Deputy Chief Brown; GTFD#6) and Quint 85 arrived and began to investigate. It was determined that the incoming resources were not needed and the assignment was held to Quint 85, Squad 25, and Engine 88. Ladder 84 responded to assist as a second truck company was requested. Crews cleared in about 45 minutes.